According to a new market report published by Transparency Market Research titled ‘Driving Protection Gear Market ((Product Type – Helmet, Armor, Gloves, Knee Protection, Elbow Protection, and Others); (Material Type – Leather, Synthetic, and Natural Fibers), (Vehicle Type – Two Wheelers and Four Wheelers), (Consumer Group – Men and Women); (Distribution Channel – Online and Offline)) – Global Industry Analysis, Size, Share, Growth, Trends, and Forecast, 2018 – 2026, the global driving protection gear market is expected to reach US$ 10,111.7 Mn by 2026, expanding at a CAGR of 5.3% from 2018 to 2026. In terms of volume, the market is expected to reach 315,621‘000 units by 2026, expanding at a CAGR of 2.7% from 2018 to 2026. The market is segmented by regions into North America, Europe, Asia Pacific, Middle East & Africa (MEA), and South America. The driving protection gear market in Asia Pacific is the largest in the world and is expected to grow at a healthy rate over the forecast period. Helmets are the most significant driving protection gear in the Asia Pacific region and hold a major market share among various driving protection gear products. China, Japan, and India are major markets in the Asia Pacific driving protection gear market. India is the largest two wheeler market in the world, followed by China. China is the largest four wheeler market in the world. Rising millennial population, increasing disposable income, and a change in lifestyle is increasing the demand for premium motorcycles in India. In India, as per Society of Indian Automobile Manufacturers (SIAM), motorcycles above 150cc are classified as premium motorcycles. From FY13 to FY17, premium motorcycle sales in India have increased at a CAGR of 31.0% and the demand is expected to continue in future. The market share of the premium segment is less in the overall motorcycle sales, which is about 12-15.0%; hence, there is room for growth of premium motorcycle sales in India. Consumers of these high-end super bikes are brand conscious and prefer branded driving protection gear products. Therefore, global driving protection gear market players in India have a good growth opportunity. Asia Pacific countries have a large number of small and medium third-party driving protection gear product manufacturers. The driving protection gear market in Europe is the second largest in the world and is expected to grow moderately over the forecast period. Helmets hold a major share in the driving protection gear product market. According to European Association of Motorcycle Manufacturers (ACEM), Italy is the largest two wheeler market, followed by France, Germany, Spain, and the U.K. In terms of four wheelers, Germany is the largest market in Europe followed by U.K., France, Italy, and Spain. Porsche AG is a global sports car manufacturer based in Germany. Porsche AG sold 80,262 cars in 2017 and 77,216 cars in 2018 in Europe. In 2017, the number of high-end cars sold by Porsche AG stood at 28,317, 14,267, 5,822, 5,534, and 3,054 in Germany, U.K., France, Italy, and Spain/ Portugal respectively. Rising sale of premium motorcycles and sports cars in Europe is increasing the demand for branded driving protection gear products. The driving protection gear market in North America holds the third largest share in the global driving protection gear market and is expected to grow moderately over the forecast period. Helmets hold the largest share in the North America driving protection gear products market. The U.S. is the largest market in North America followed by Canada. As per Insurance Institute for Highway Safety (IIHS), motorcycle sales in the U.S. increased from 8,372,614 in 2016 to 8,392,682 in 2017. In the overall motorcycle sales in the U.S. in 2017, sales of touring, sport touring, sport, and supersport motorcycles stood at 1,769,520, 190,113, 425,322 and 649,858 respectively, holding a market share of 21.1%, 2.3%, 5.1%, and 7.7% respectively. Thus, rise in sale of premium motorcycles in the U.S is driving the demand for branded driving protection gear products. The South America driving protection gear market is the fourth largest in the world. Brazil continues to be the largest driving protection gear market in South America and the market is expected to expand during the forecast period. Middle East &Africa driving protection gear market is the smallest in the world. GCC and South Africa are major markets in the MEA driving protection gear market. The study provides a conclusive view of the global driving protection gear market by segmenting it in terms of product type, material type, vehicle type, consumer group, and distribution channel. In terms of product type, the market has been classified into helmet, armor, gloves, knee protection, elbow protection, and others. The others category includes driving goggles, kidney belt, etc. Based on material type, the market has been segmented into leather, synthetic, and natural fibers. Based on vehicle type, the market is segmented into two wheelers and four wheelers and based on consumer group, the market is classified into men and women. In terms of distribution channel, the market is segmented into online and offline. 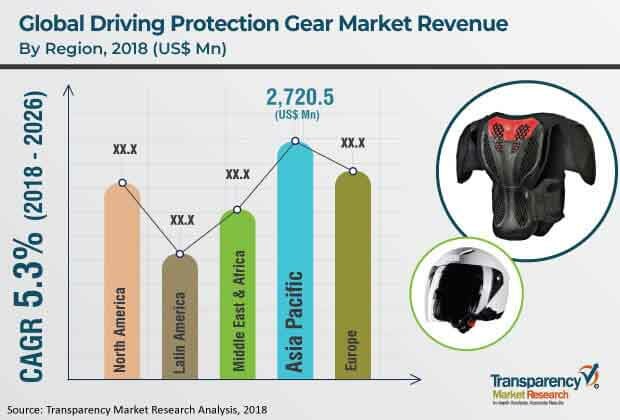 The report highlights major companies operating in the global driving protection gear market including Alpinestars S.p.A, Dainese S.p.A, Fox Head Inc., SCOTT Sports SA, Lemans Corporation, Sparco S.p.A, Leatt Corporation, EVS Sports, Troy Lee Designs, and OMP Racing S.p.A.